Map of the Everglades ecoregion as delineated by the WWF. Satellite image from NASA. 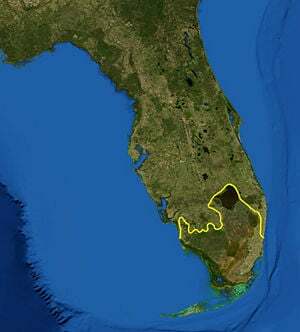 The yellow line encloses two ecoregions, the "Everglades" and the "South Florida rocklands." The South Florida rocklands ecoregion includes the Florida Keys and offshore islands and two patches within the Everglades. The Florida Everglades is a subtropical marshland located in the southern portion of the U.S. State of Florida. Though modified by agricultural development in central and southern Florida, the Everglades is the southern half of a large watershed arising in the vicinity of Orlando known as the Kissimmee River system. The Kissimmee flows from Taylor Creek, Nubbin Slough, and Fisheating Creek, and discharges into Lake Okeechobee, a very large (730 mi² or 1,890 km²), shallow (10 ft or 3 m) fresh water lake. Water leaving Lake Okeechobee in the wet season forms the Everglades, a shallow, slow-moving flood at one time 40 miles wide and over 100 miles long moving southward across a nearly flat, limestone shelf to Florida Bay at the southern end of the state. Few places are as biologically rich as the ecosystem that lies within the Florida Everglades. The area is home to rare and endangered species, such as the American crocodile, Florida panther, and West Indian manatee. Over 1,000 species of plants live here, many endemic to the area. However, approximately 50 percent of the original Everglades has been lost to agriculture. The remainder is now protected through Everglades National Park, as well as its designation as an International Biosphere Reserve, a World Heritage Site, and a Wetland of International Importance. 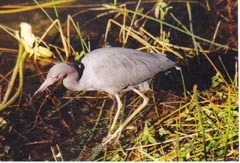 A little blue heron hunting near water on Anhinga Trail. A great blue heron wading in a pond near Shark Valley. 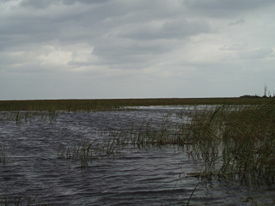 The Everglades are a popular tourist attraction. Few places are as biologically rich as the ecosystem that lies within the Florida Everglades. The area is home to rare and endangered species, such as the American crocodile, Florida panther, and West Indian manatee. Over 1,000 species of plants live here, many found nowhere else. The soil of the islands is very fertile and is subject to frequent inundation, but gradually the water area is being replaced by land. The vegetation is luxuriant, the live oak, wild lemon, wild orange, cucumber, pawpaw, custard-apple, and wild rubber trees being among the indigenous species; there are also many varieties of wildflowers, the orchids being especially noteworthy. The various communities of vegetation include pineland, dry prairies, wet prairies, broad-leafed hammocks, mangrove swamps, sawgrass marshes, coastal marshes, and inshore marine systems. There are nearly 350 species of birds recorded in the Everglades, both temperate and tropical. Specialties of the park include the short-tailed hawk and smooth-billed ani, and the Caribbean flamingo at its only regular North American mainland site, usually near the town of Flamingo. Other wading birds such as herons, egrets, wood storks, roseate spoonbills, and ibis are abundant. Limpkins can also be found in the Everglades. The raptors include the rare snail kite and the very common red-shouldered hawk and osprey. From the town of Flamingo, the water and mud flats of Florida Bay allow views of pelicans, shorebirds, terns, and skimmers. The waterways are inhabited by otters, manatees, alligators, and crocodiles. Everglades National Park is the only place in the world where alligators and crocodiles coexist naturally. About 45 species of mammals including deer, raccoon, and the severely endangered Florida panther are found here. The Everglades are home to an extensive variety of reptiles, such as alligators and snakes. The American Alligator is native only to the southeastern United States, where it inhabits wetlands that frequently overlap with human-populated areas. As during the Reptile Age, alligators live in wetlands, and it is this vital habitat that holds the key to their continued long-term survival. Alligators depend on the wetlands, and in some ways the wetlands depend on them. As predators at the top of the food chain, they help control the population of rodents and other animals that might overtax the marshland vegetation. The American Crocodile exists in some parts of the Everglades and can grow considerably larger than their alligator relatives. They are, however, very rare and can only be found in considerable numbers in a few isolated pockets along the southern coast. The American crocodile has an estimated wild population of 500 to 1200 in South Florida. On March 20, 2007, the U.S. Fish and Wildlife Service declassified the American crocodile as an endangered species, downgrading its status to “threatened”; the reptile remains protected from illegal harassing, poaching, or killing under the federal Endangered Species Act. The Florida Panther is a critically endangered cougar that lives in the low pinelands, palm forests, and swamps of southern Florida. Males weigh about 150 pounds and live within a range that includes the Big Cypress National Preserve, Everglades National Park, and the Florida Panther National Wildlife Refuge. This population, the only unequivocal cougar representative in the eastern United States, currently occupies only five percent of its historic range. The Florida Panther continues to be one of the most intensively and expensively protected feline populations in the world. The southeast trade winds create tropical to subtropical weather patterns in the Everglades with mean monthly temperatures ranging from 63° F (17° C) to 82° F (28° C). It is pleasantly mild and dry from December through April. Most rainfall occurs in the warmer months from May through October with annual averages of 40 to 65 inches (1,000 to 1,650 mm). With a regular humidity level of nearly 90 percent, strong showers and thunderstorms occur almost daily during the summer months. Hurricane season officially runs from June 1 to November 1. The Everglades face an ongoing threat from the melaleuca tree (Melaleuca quinquenervia). Sprinkled from airplanes using salt shakers, the tiny seeds of the thirsty tree were intended to soak up the water to help make the Everglades suitable for development. The oils in these trees are highly flammable, which could increase danger from wildfires. The tree remains an invasive problem. Brazilian Pepper, (Florida Holly) has also wreaked havoc on the Everglades, exhibiting a tendency to spread rapidly and crowd out native species. It is especially difficult to eradicate and is readily propagated by birds, which eat its small red berries. The Brazilian Pepper problem is not exclusive to the Everglades; however, neither is the Water Hyacinth, which is a widespread problem in Florida's waterways and a major threat to endemic species, and is also difficult and costly to eradicate. Native to southern Asia, the Burmese python, Python molurus bivittatus is a relatively new invasive species in the Everglades. This large snake's population growth is due entirely to the indiscriminate pet trade, a growing cause of invasive species in the United States. Florida wildlife officials speculate that residents released their pet pythons after discovering the snake had grown too large to keep (record length in captivity is 27 feet). 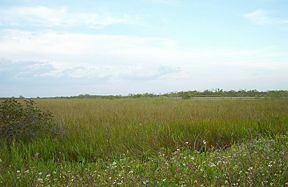 The Everglades habitat is perfect for bivittatus, and this species is said to be reproducing rapidly. There have been at least four recorded encounters between alligators and this large snake. An overlook of the Florida Everglades, viewed from the Shark Valley observation tower, in Everglades National Park. For much of its history, systematic exploration of the Everglades was prevented by the dense growth of sawgrass (Cladium jamaicense), a sedge with very sharp saw-toothed leaves. The first European to enter the region was Escalente de Fontenada, a Spanish captive of a Native American chief, who named a lake, Laguno del Espiritu Santo, and some islands, Cayos del Espiritu Santo. The coastal regions of the Everglades were inhabited by Calusa and Tequesta Indians who called this area Pa-Hay-Okee (Grassy Water). They used dugout canoes for hunting, fishing, and gathering roots along the coast and inner waterways. With the arrival of the first European explorers in the sixteenth century came disease and warfare, which largely eliminated both tribes from the area by the late 1700s. The area was then inhabited by the Creek peoples (later known as Seminoles), who found the marshes and swamp areas a safe haven from early white settlers. They built structures called chickees, which were bald cypress log frames with palmetto-thatched roofs over raised wooden platforms that provided cooling and protection from animals, insects, and flooding. They set up these homes in camp-style communities. For sustenance, in addition to hunting and fishing they gathered berries, roots, and nuts and planted corn, beans, squash, and melons. Most of these people were attacked and forced from the area during the Second Seminole War (1835–1842). However, the Miccosukee tribe who were originally part of the Seminoles continue to live in the Everglades today. By 1858, the Seminole Wars had ended and exploration of the Everglades centered mainly on exploiting various wildlife, such as alligators for their hides as well as herons and egrets for their feathers. This caused severe reduction in wildlife numbers, which ultimately led to legislation in the early 1900s protecting plume birds. Restrictions on hunting alligators occurred shortly after. They were placed on the endangered-species list for several years until repopulation took place. Under the Arkansas Bill, or Swamp and Overflow Act, practically all of the Everglades, which the state had been urging the federal government to drain and reclaim, were turned over to the state for that purpose, with the provision that all proceeds from such lands be applied to their reclamation. Between 1881 and 1896 a private company owning 4,000,000 acres (16,000 km²) of the Everglades attempted to dig a canal from Lake Okeechobee through Lake Hicpochee and along the Caloosahatchee River to the Gulf of Mexico; the canal was closed in 1902 by overflows. Six canals were begun under state control in 1905 from the lake to the Atlantic, the northernmost at the town of Jensen, the southernmost at Ft. Lauderdale. In 1905, Governor Napoleon Bonaparte Broward began the project to drain the Everglades to create land suitable for agriculture and development. Large areas of the swamp were transformed into productive farmland, and new cities such as Miami and Ft. Lauderdale began to increase in population along the coast. The need to provide flood control to the new residents of South Florida soon became a priority. In 1948, the U.S. Congress authorized the Central and South Florida Project, which created the world’s most effective water management system. However, due to the addition of new levees, canals, and water control systems, the natural marsh habitat for wading birds, fish, and dozens of animals was severely altered. Saltwater flowed farther into the marsh from the ocean, and pollutants flowed in from nearby farms and cities. The change in water quality inhibited the growth of native plants and fueled the growth of algae that contributed even more to the loss of natural habitat. This cycle continued for nearly 50 years, and as a result, the size of the Everglades today is half of what it was a century ago. In order to regain and protect this national treasure, Florida is undertaking the largest environmental ecosystem restoration in the world. One of Florida’s top priorities is to provide the necessary water supply for South Florida’s growing population and improve flood control, all while preserving America’s Everglades and protecting the natural wildlife and plants for generations to come. View of vast sawgrass expanse north of Anhinga Trail. Rocks found beneath the Big Cypress Swamp and in the northwest corner of Everglades National Park are some of the oldest in South Florida. Six million years ago a shallow sea covered this area. The sediments of sand and silt were deposited on the bottom of this shallow sea and cemented into limestone over time. This rock is now called the Tamiami Formation. A nutrient-rich mixture of fresh water flowing out of Big Cypress mixes with salt water from the Gulf of Mexico to support a marine nursery for pink shrimp, snook, and snapper. During the time of the Great Ice Age, other rocks formed beneath the Everglades. Although no glaciers developed in Florida, glaciers in other areas of the world expanded, trapping much of the earth's water supply in the ice. Sea levels dropped as much as 300 feet below present levels in South Florida. There were actually four shorter ice ages with interglacial stages of warming in between that make up The Great Ice Age. During these periods, the ice melted back into the sea. The last interglacial stage occurred about 100,000 years ago. During its peak, the sea level in South Florida rose 100 feet above present levels. In the calmer waters that covered the central areas of the Park, very small moss animals called Bryozoans flourished. After deceasing, their calcium skeletons settled to the bottom, and these sediments later cemented into rock known as the Miami Bryzoan Limestone. Larger deposits of limestone were laid along the higher Atlantic coastal ridge that runs from the area of Lake Okeechobee south to the park caused by the slightest tilt to the west and south. This ridge played a key role in the channeling of the water flow. "… wilderness, (where) no development … or plan for the entertainment of visitors shall be undertaken which will interfere with the preservation intact of the unique flora and fauna of the essential primitive natural conditions now prevailing in this area." This mandate to preserve wilderness is one of the strongest in the legislative history of the National Park System. The Park preserves the southern portion of the Everglades (all south of Tamiami Trail), covering 2,357 mi² (6,105 km²) making it the 3rd largest national park in the lower 48 states, behind Yellowstone National Park (2nd) and Death Valley National Park (1st). The park was designated an International Biosphere Reserve on October 26, 1976. On November 10, 1978, most of the park was declared a wilderness area. Wilderness designations covered 1,296,505 acres (5,247 km²) in 2003—about 86 percent of the park. It was listed as a UNESCO World Heritage Site on October 24, 1979, and as a Wetland of International Importance on June 4, 1987. However, in 1993 it was placed on the List of World Heritage Sites in danger. In October 2005, Hurricane Wilma swept across the tip of Florida and had devastating effects on the park. Heavy damage was sustained at the Flamingo area of the park. The visitor center, lodge, restaurant, and marina store were shut down, with the area closed off to all visitors until March 2006. Everglades National Park is surrounded by the urban and agricultural areas of Miami, Homestead, and Florida City to its east, the Florida Straits and Florida Keys to its south, the Gulf of Mexico to its west and Big Cypress National Preserve to its north. Big Cypress is similar to the northern portion of the Everglades and is about half the size of the park itself. At the southwestern shore of the park is Ingraham Lake, the southernmost lake in the United States. In the southeastern section of the park is the Earnest F. Coe Visitor Center, the park headquarters. It is located just to the west of Homestead and Florida City on Florida State Road 9336. Four miles to the west of the headquarters is the Royal Palm Visitor Center. The general area of Royal Palm and the headquarters is nestled in a pineland area, as are the Hidden Lake Education and Daniel Beard centers a few miles to the west. The large Taylor Slough runs from Royal Palm to Florida Bay. To the west of Royal Palm is also Long Pine Key. Long Pine Key (which is not actually an island) is located about four miles from Royal Palm on 9336 and is a prominent camping area in the forest-like pineland area. Another four miles to the west on 9336 is the Pahayokee Overlook, which is a raised observation platform that overlooks the park to the north. Continuing south, Florida State Road 9336 runs through a large cypress swamp. Just on the outside edge of this swamp is Mahogany Hammock, a trail located twenty miles from the headquarters, deep in the park. Even farther south, one comes into the coastal mangrove swamps. Hidden in the thousands of mangrove trees are hundreds of small bays and rivers that empty into the Florida Straits. The swampy estuaries in this area are the only place in the U.S. where crocodiles can be found, although they are very rare. Also in these areas are manatees, which are often spotted at the surface on cool autumn mornings. At the very end of 9336 is the Flamingo Visitor Center, the farthest south visitor center in the park. It is located on the arid coastal prairie and lies just to the north of Florida Bay. Trails leading from Flamingo go west onto Cape Sable, a cape in the extreme southwestern part of Florida. Also leading from Flamingo is the 99-mile Wilderness Waterway, a canoe trip from Flamingo in the south to the Gulf Coast Visitor Center in the north. The Gulf Coast Visitor Center serves as a visitor center for both the northwestern part of the everglades and the neighboring Big Cypress National Preserve. In the northern section of the park, the most prominent area is the Shark Valley Visitor Center. A tram road, which starts and ends at this center extends about seven miles from the northeastern border of the park into the Shark River Slough, an extensive freshwater slough that flows from Lake Okeechobee (north of the park) to the southwestern coast of Florida. The Shark River Slough is dotted with hundreds of small, jungle-like hardwood hammocks, which are home to many of the Everglades mammals and raptors. The general Shark Valley area is perhaps what most visitors think of when they think of the Everglades, as it is surrounded by a seemingly eternity of sawgrass in all directions. Alligators and wading birds often come within feet of visitors, and occasionally, a lazy alligator will block the road. At the point in the Shark Valley tram road where it turns back north there is the Shark Valley Observation Tower, a sixty-five-foot tower that overlooks the sawgrass prairie to the south. Ernest Coe Visitor Center, Homestead. Open year-round, this center offers educational displays, informational brochures, orientation films, and a number of walking trails just a short drive away. Flamingo Visitor Center, Flamingo. Educational displays and informational brochures are available. Public boat ramps as well as several hiking trails are located nearby. Shark Valley Visitor Center, Highway 41 (Tamiami Trail). Located in the heart of the Everglades with educational displays, informational brochures, and guided tram tours. Bicycles may be rented at the center. Gulf Coast Visitor Center, Everglades City. The gateway for exploring the Ten Thousand Islands, with mangrove islands and waterways that extend to Flamingo and Florida Bay. This center offers educational displays, informational brochures, orientation films, boat tours, and canoe rentals. Experience ranger-led talks and tours, which are common throughout the park. Take a tram ride at Shark Valley. There is a guided two-hour narrated tram tour along a fifteen-mile loop. Go fishing. The backcountry is world-renowned for snook and baby tarpon. Local guides will take you for a day of amazing saltwater fishing—tarpon, bonefish, redfish, snook, snapper, and sea trout are all waiting for you. Separate saltwater and freshwater Florida fishing licenses are required. Take a narrated boat tour or bring your own boat. Canoe rentals are also available to explore nearby waterways. 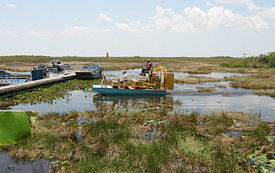 Boat ramps within Everglades National Park are located at Flamingo, Little Blackwater Sound, and West Lake. Feel the excitement of an airboat ride. Explore this ecosystem on a heart-pounding ride or choose a more relaxed airboat tour. Go camping. Two drive-in campgrounds are located within the park. Long Pine Key Campground is located six miles from the Ernest Coe Visitor Center. Flamingo Campground is located near the Flamingo Visitor Center on the shores of Florida Bay. Visit Anhinga and Eco Pond Trails. These two trails are impressive areas, as they stay wet all year, revealing an abundance of natural beauty. Wildlife likely seen here are alligators, great blue herons, anhingas, double-crested cormorants, garfish, bass, talapia (and other fishes), various turtles (hard and softshell), snowy egrets, tri-color herons, greenback herons; also possible to find here are deer, great white herons, bitterns, limpkins, purple gallinules, avocets, roseate spoonbills, ibis, wood storks, snail kites, and sandhill cranes. Florida Panthers are rarely seen, but have been spotted here. The fate of the Everglades still hangs in the balance. Although much is being done to assure the survival of this national heritage, continuing pressures associated with urbanization and agriculture require a constant search for additional solutions. With a continual influx of residents and visitors thirsting for the same water crucial to the wildlife's survival, the Everglades' fate remains in the hands of citizens and public officials who share in the responsibility for finding solutions to the problems. There is a growing consensus in South Florida that the economic and social prosperity of the region cannot be sustained without a healthy ecosystem. National Park Service. Everglades. Retrieved July 19, 2007. World Heritage. Everglades National Park. Retrieved July 19, 2007. South Flordia Water Management District. 2007 South Florida Environmental Report (SFER). Retrieved July 19, 2007. Wiki Travel. Everglades, Retrieved July 23, 2007. Carr, Archie Fairly. 1973. The Everglades. The American wilderness. New York: Time-Life Books. Luong, QT. Everglades National Park. Terra Galleria. Dinerstein, E; Weakley, A; Noss, R; Tipton, R; Wolfe, K. Everglades (NT0904). World Wildlife. Wilderness. Marjory Stoneman Douglas Wilderness. This page was last modified on 10 August 2017, at 18:13.